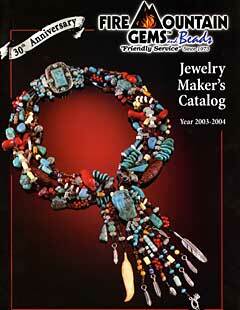 Marlynn McNutt is Fire Mountain Gems and Beads' featured catalog cover artist for the 2003-2004 Jewelry Maker's Catalog with her turquoise and coral masterpiece. Marlynn had the opportunity to shop the Fire Mountain Gems and Beads warehouse to pick out strands and individual beads to incorporate into this necklace. She pulled inspiration from a piece she was designing on her own--a fabulous collection of components she had been gathering for years of her travels around the country. Although her personal necklace included gemstrands from Tennessee, a collection of beads from Canada, a stone from Mt. Zion National Park, original lampwork beads from an artist in Cave Junction, Oregon ... the cover piece focused on a Southwestern theme. Marlynn began beading in Seldovia, Alaska when a friend invited her to a weekly bead day with local tribe members. The first project was a dreamcatcher, followed by beaded earrings, and then amulet bags and peyote stitch--the technique that started it all. ''My passion grew and grew for peyote stitch ... Now it's an obsession!'' she laughs. Marlynn soon learned of Fire Mountain Gems and Beads and quickly became a loyal customer. She even moved over 3,000 miles to Grants Pass, Oregon in 2002 to work as a customer service representative for her favorite bead supplier. Everyday she would bring in a new design, a finished project or the idea of a new creation. The products inspire her designs--''the beads seem to know what they want to be. They guide me to their final state.'' From the runway and magazines to the customers that she meets--she's inspired by tiny segments of what she sees and uses that as inspiration for her own creations. To see more of Marlynn's work, visit the Gallery of Designs and view the Beading Instructions and Video Tutorials in the Instructions section.